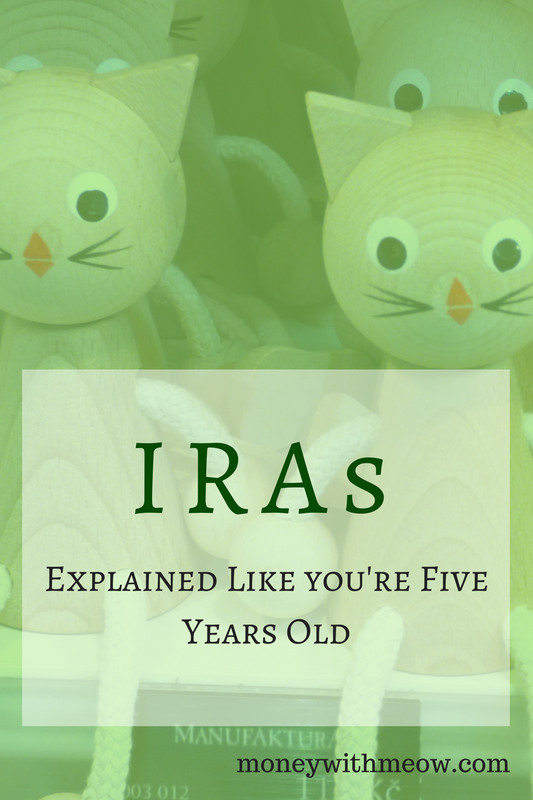 One of the most vexing acronyms in the personal finance world is the IRA. Lots of smart people are confused about IRAs, simply because they've never had it explained to them in simple terms. Their confusion is made worse by financial websites or advisers who explain it to them using lots of jargon and acronyms. So here is a simple explanation of IRAs. As always, if you can find a way for me to make this explanation any clearer or simpler, please send me a comment or an email at hello@moneywithmeow.com. IRA stands for "Individual Retirement Account" or "Individual Retirement Arrangement", depending on who you ask. The IRS says "arrangement", but almost everyone else, including banks, says "account". Either's fine. An IRA is a kind of bank account with special tax powers. Note: There are other special retirement accounts too, like 401(k)s, 403(b)s, SEPs, SIMPLEs, and more. Today, we are going to just focus on IRAs. The government wants to bribe you to save for retirement, but the government's only way of influencing people's actions is to affect their taxes. Just like high taxes on cigarettes and alcohol are meant to steer people away from making those choices, special tax treatment on a retirement bank account is meant to steer to towards using it. Why does the government care if you save to retire? Well, someday you're going to be too old to work, but you're never going to be too old to eat or need a roof over your head. The idea is that if you don't do it, the government will have to. Social Security was never meant to cover your costs completely, and pensions have gone the way of the dodo. You could work until you die, if you're lucky and your health allows, but the government thinks it better if you graciously step aside and let someone younger have your job. So, in order to give you an advantage, they made up this very special sort of bank account, the IRA- arguably the US Government's greatest gift to the working class. There are a few different flavors of retirement accounts with special tax advantages, but the most common one is a Traditional IRA. We'll call it a tIRA going forward. There's another IRA too, called a Roth, but let's save that for later. Let's just start with tIRA. With the tIRA, when you put money in (called a contribution), you don't have to pay income taxes on it that year. So if you made $50,000, but put $5000 in a traditional IRA, when you're filling out your taxes the government taxes you like you made $45,000. So not only can contributing to a tIRA save you taxes, but it can also lower the cost of your health insurance premiums if you buy a marketplace plan. Now, you don't get to hide that money from the tax man forever. You'll be taxed on it later, when you're old. Since most of us live on less money in retirement than we made during our working lives, and tax rates are lower the less money you make, you could end up saving thousands or tens of thousands in taxes just by deferring them (paying them later). Essentially, you're kicking the tax can down the road until some time in the future when it's less painful. If your tax rate is 35% while you're working, and 10% when you retire, wouldn't you rather pay the 10%? So if you're poorer than that, the IRS wants to give you cash money to save in your retirement account! When you put money in a normal, non-IRA bank account, the money you put in has already been taxed a few ways: income taxes and employment taxes have come out of your paycheck. If you are self-employed, you pay these same taxes, even if they aren't withheld from your paychecks for you- you have to do the withholdings yourself. Either way, by the time you're done paying income taxes, only a percentage of your money is left. So any money you spend or save in a normal account is considered post-tax dollars. But since you don't have to pay income taxes on contributions to a tIRA, you contribute with pre-tax dollars- dollars that don't have a chunk lopped off of them and sent off to the government yet. 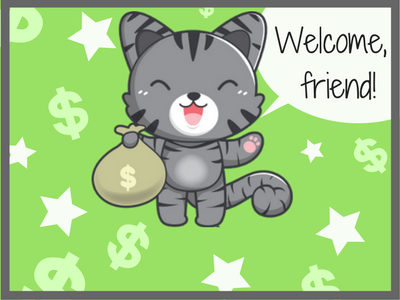 Those dollars stay blissfully whole, which matters a lot when those dollars are making interest. And when those dollars make interest, the interest doesn't get taxed yet either- so the interest's interest can make interest, and the interest's interest can make interest, and so on forever.... without the government taking away a bite in between every time. This is the big one, guys. This is what makes IRAs very special, magical accounts. See, an IRA doesn't just have to be a savings account. You can also invest the money. When you invest, your money makes money. When your money makes a profit, you owe taxes on that profit for the same year you make the profitable sale. But not in an IRA. Let's say that in 2016, you bought a stock for $50 and sold it for $60. In a non-IRA account, you'd owe taxes on the profit ($10) by April 15, 2017. If your tax rate was 10% of that $10, you'd pay the IRS a dollar and be left with $9 in profits after the taxes. You now have $9 to reinvest. So you buy a stock with the $9 and it goes up 10%. Your stock is now worth $9.90. Now, let's buy and sell the same stock in an IRA account. You still make $10 in profits. Since it's in an IRA, you don't owe any taxes right now. You can now reinvest the full $10. It goes up by 10%, just like in the example above. It's worth $11. $9.90 vs $11.00 at the end of year one might not seem like much, but if you repeat this year after year, thanks to compounding, the taxes will really stunt the growth of your money. This is called tax drag and no, it's not a a male IRS agent dressing up as a woman. It's more like a ball and chain tied to your investments, keeping them from soaring. But IRAs have special status. As long as the money and investments stay inside the IRA, you can trade, profit, and take in dividends all day, and not pay a dime in taxes until you pull the money out of the IRA - when you're you're older than 59.5. Glad you asked. For a traditional IRA, when you stash that money, you're making a promise not to touch it until you are 59.5 years old. Remember, this is the government bribing you to save for when you are old. You can take the money out, but the results aren't pretty. What happens if you take money out of your traditional IRA but you haven't hit 59.5 yet? That's called an early distribution. You owe taxes on any early distributions you make, as well as a 10% penalty on top of that, so it's very expensive to touch that money. There are exceptions to this. I plan on writing another article on this, but here's the IRS's explanation on the exceptions. I'll translate this into plain English later. Your taxable compensation for the year if it's smaller than $5,500 (or $6,500 if you're 50+). That means if you're younger than 50 and make less than $5,500 of taxable income in a year, you can only contribute up to the amount you made. I'm going to leave it there for now and let this sink in. Later on I'll come back and tell you about that other flavor of IRA, the Roth, but before you go on and read that, I want to make sure that none of this was confusing. Please leave me a comment if there's anything I can clarify for you.